During the primary-election examination, the Obama Web site focused heavily—more than that of any other candidate from either party—on engaging supporters and motivating them to turn their enthusiasm into on-the-ground, grassroots activities. Since the primary season, the Obama campaign has managed to stay more than a few steps ahead of the McCain campaign on both counts. But now the McCain campaign has taken steps to close the gap. It has redesigned his Web site to add more information, more customization tools, and advanced social networking capabilities. To measure how much the Web sites allowed users to engage and participate online, PEJ analyzed the sites on the basis of four general elements: What interactive features were present that allowed users to engage or converse with the campaign? How much customization was there to enable users to shape their Web experiences? What information delivery tools existed to allow users to easily access campaign updates? And to what extent did the Web sites facilitate grassroots activities such as donating and raising money, hosting gatherings, registering voters, making campaign calls, and canvassing door-to-door? Both campaign Web sites offer two ways of facilitating user engagement—allowing people to communicate with the campaign, personalize their own pages, and sign up to receive information updates. For most of the summer, however, many of these features on the McCain site were not yet operational. They are now up and running. The Obama customization page, “MyBarackObama” or “MyBO,” has been extensive and active for months. Users can set up their own “dashboard” home page which closely resembles a Facebook page. They can post a profile, write a personal blog and link to their favorite Obama-related groups or individuals in their “network” of fellow Obama supporters. 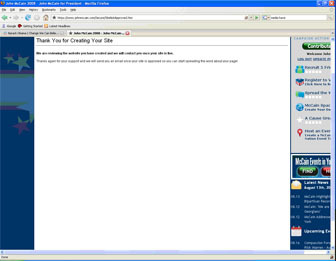 The McCain Web site offers customization tools through “McCainSpace,” a feature advertised as early as 2007 but not fully functioning until August of 2008. As late as August 1, the only option was to create a personal page—and even that was still not really working. That page displayed only a generic note that the page was “under construction” and they would notify us when it went live. PEJ was notified on August 28. As that page went live, McCainSpace also launched additional customization features. Users can now post McCain videos, pictures and blogs to their home pages, and with a few clicks send any of that material out to users of 25 different social networking sites. Both candidate Web sites offer targeted information to people of different demographic groups. Here again, the McCain campaign gained ground between August and September. The dropdown menus from the “People” link atop the Obama home page features a menu of 20 different demographic groups, four of which have been added since early August. The McCain site (he uses the term “coalitions” instead of “people”) links to 17 groups, but 11 of those were added in recent weeks. Finally, both Web sites offer RSS feeds and let users sign up to e-mail updates. Since the primary season, Obama has added mobile phone text updates to his list of delivery options. 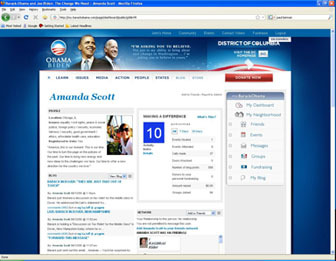 The campaign, not entirely successfully, attempted to use this to announce Obama’s vice presidential pick, offering users an opportunity to become “the first to know” about the news. Neither candidate offers podcasts of campaign information, something only a few candidates offered during the primary season. Both candidate Web sites have encouraged users to volunteer their labor, with tools allowing users to register to vote and organize meetings with neighbors. But Obama’s Web site does so in a way that is more comprehensive, more sophisticated and easier to use than McCain’s. My.barackobama.com (MyBO), allows users to join groups, connect with other users, plan events, raise money and volunteer. And one new element in particular stands out: a dynamic Web-based phone banking tool. This tool allows a user to—with only a few mouse clicks—make phone calls from their homes to undecided voters in key swing states using campaign-generated scripts. The scripts even change and adapt as the call progresses, depending on how voters respond to questions. 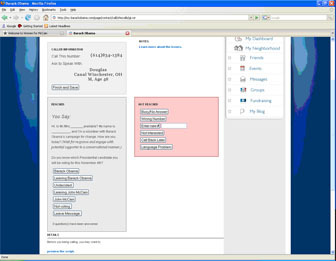 The web page then allows volunteers to record and save the responses into the Obama database. The McCain site offers only the more basic grassroots functions and with some more difficulty for the user. Supporters are able to donate and raise money, create or find a local event,volunteer for the campaign, and share talking points with others. This was one area that saw little change from August to September. One technique both campaigns employ is awarding “points” to users who engage in the most activities, providing supporters a measure of their impact on the campaign. McCain’s Web site also posts a “leaderboard” that ranks the top activists of each week.